Some of the leading rebreather manufacturers linked up in Malta with TDD¹s Vikki Batten and Karl Shreeves for the start of a week of rebreather diving. The goal is for Vikki and Karl to bring real-world, hands-on experience with unit-specific techniques and manufacturer recommendations as part of the developing the PADI Rebreather Diver and Tec CCR Diver courses. The group also collaborated on photography. 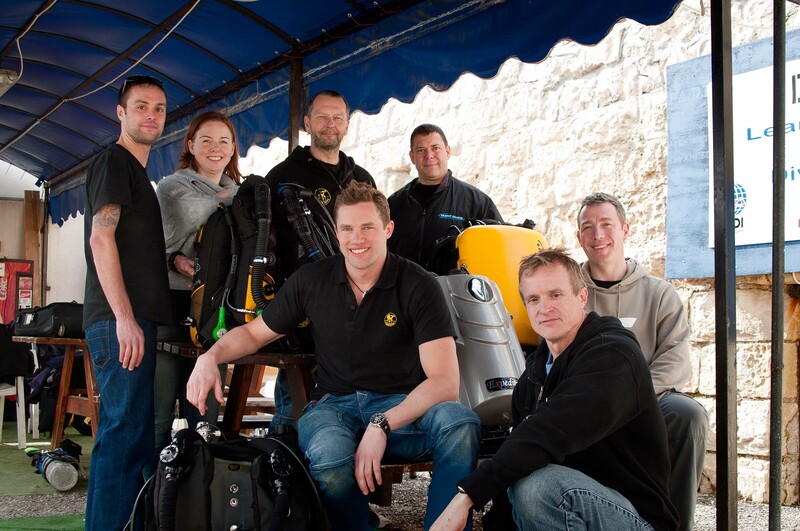 From left to right, back row, Tony Read, Silent Systems/Ambient Pressure; Vikki Batten, PADI Technical Diving Division; Sverker Palmblad, Poseidon; Mike Fowler, Silent Systems/Ambient Pressure; Marcus Benér, Poseidon; Karl Shreeves, PADI Technical Diving diving; Al Wright, VR Technologies.